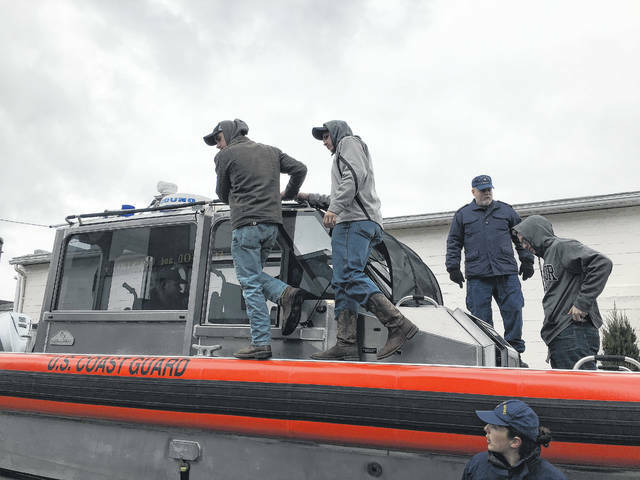 Students tour a U.S. Coast Guard boat, taking the opportunity to ask members of the Coast Guard about the vessel. The students were able to partake in a mini deckhand training session. Students visit the Point Pleasant River Museum and Learning Center to experience the pilot house simulator. 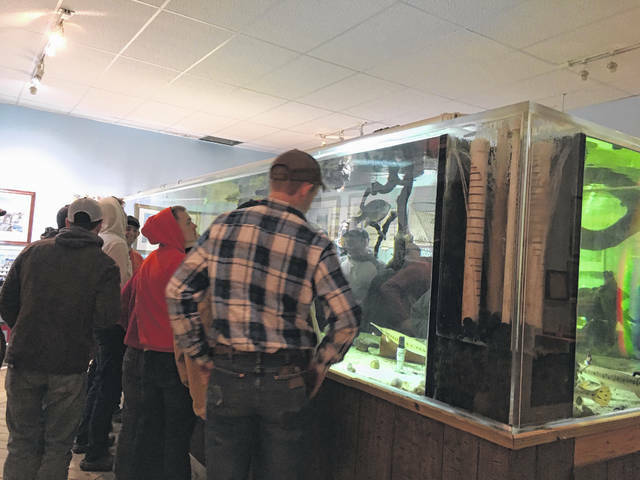 Students admiring the fish tank at the river museum. OHIO VALLEY — Living along the river offers careers to residents of those river communities of which the youth may be unaware. Recently, the Who Works The Rivers event returned to Point Pleasant for its fourth year, pulled off via a cooperative effort between RiverWorks Discovery, the Point Pleasant River Museum and Learning Center, and several local river industry employers. RiverWorks Discovery is a national outreach education effort of the National River Center and Hall of Fame located at the National Mississippi River Museum and Aquarium. Erinn Howard, of RiverWorks, said the program began in 2011 in Pittsburgh, Pa. and has since reached 15 cities in the country. To begin the day on Wednesday, 64 seniors from Buckeye Hills Career Center (BHCC) in Gallia County and Mason County Career Center (MCCC) gathered together in the American Legion Building for a career fair listening to presentations from Amherst Madison, AEP River Transportation, Superior Marine, Campbell Transportation Company, Mount West, United States Coast Guard (USCG) and USCG Auxiliary, Marshall University, USACE, and Seamen’s Church. Butch Leport explained each presenter had approximately eight minutes to educate the students on their careers. “They are done everywhere to educate these young folks, there is a career that is a decent paying job…it isn’t a bad career move…we like to share it with these young folks because they are the backbone of our country,” said Leport. Howard said she is, “amazed,” by the collaboration efforts between everyone that helps make this event possible. She shared the event is an eye opening experience for students wherein they can learn about lucrative job opportunities that do not require extensive schooling. Prior to the career fair, door prize tickets were distributed among the students and the drawing commenced after the career fair. 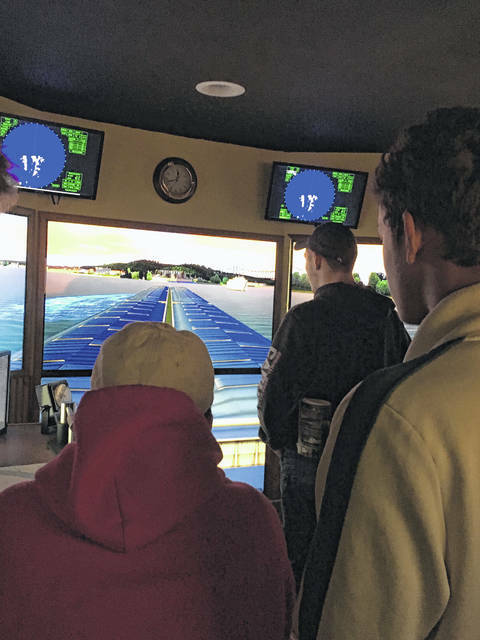 After a lunch, the students separated into groups of three to rotate between visiting the river museum where they could experience the pilot house simulator, having a mini deck hand training session where they practiced throwing a line, and taking a tour of a U.S. Coast Guard boat. Tim Updike, instructor at BHCC, shared after attending Who Works the River, he will take 14 of his students to Mount West for a deckhand class, a program that started last year.